Gatlinburg is full of attractions, restaurants, shopping, and family entertainment. It’s also a wonderful place to stay for your visit. Less than ten miles away from Pigeon Forge, there is easy access to all of the best places to spend your vacation. 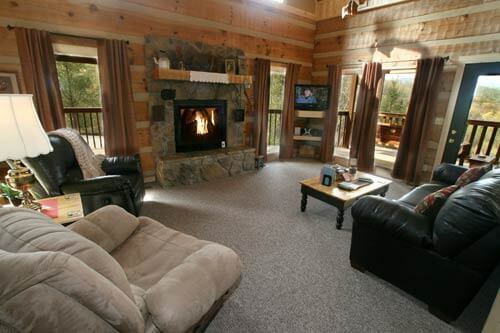 We’ve highlighted five great types of places to stay in Gatlinburg so you can narrow down your search when it comes to booking lodging. Offering more than just a place to sleep, hotels and motels also typically have a pool, breakfast, and additional amenities. After the Gatlinburg area wildfires, the Lodge went through a rigorous restoration and cleaning process using environmentally friendly products to bring it back to its former glory and make it better. They offer rooms, suites, and private cottages. A hot breakfast is complimentary each morning. They have a fitness room and seasonal outdoor pool with a slide available for guests. Toddlers can enjoy the splash pool. 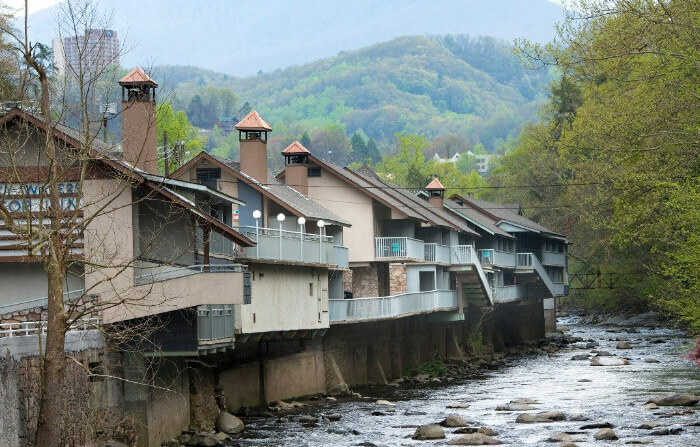 If you plan on doing a lot of shopping and visiting attractions in Gatlinburg, Greystone Lodge on the River is right across from Ripley’s Aquarium of the Smokies and has a trolley stop in the front of the building. Learn more about the Greystone Lodge on the River by watching Erika, our Smoky Mountain Explorer, take a tour. 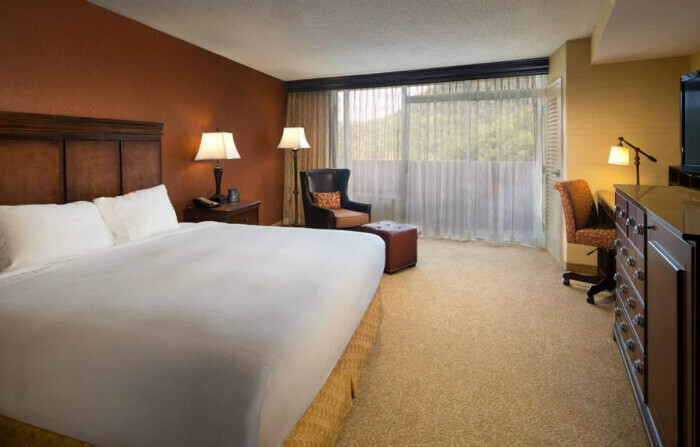 Every room has a private balcony overlooking the Smoky Mountains. There are accessible rooms available upon request, as well. The rooms are designed to provide a modern vacation experience and boast all the comforts of home, including flat screen TVs, free HBO, and free wireless high-speed Internet. If you’re hungry, you can get room service or head to the Vista Grill for breakfast, lunch, or dinner. Visit Firefly’s Patio Lounge for a great panoramic view of the mountains with cocktails. Those who are interested in maintaining your workout routine while away from home will enjoy the on-site fitness center, complete with free weights and equipment. Water amenities include a heated indoor multi-tiered swimming pool with a waterslide, a hot tub, and kids wading pool. Rocky Waters Motor Inn has been on the Parkway serving guests since the late 1930s. All of the rooms in this iconic building have private riverfront balconies. For an additional charge, you can also get a room with a woodburning fireplace and Jacuzzi. Rocky Waters offers an outdoor pool, free Wi-fi, and a complimentary continental breakfast, which is available at their sister hotel (Days Inn) across the river. You’ll need to make your breakfast, but condos are a great hybrid between a hotel and a cabin. They offer some of the same amenities as hotels, but with more privacy and larger accommodations like a cabin. 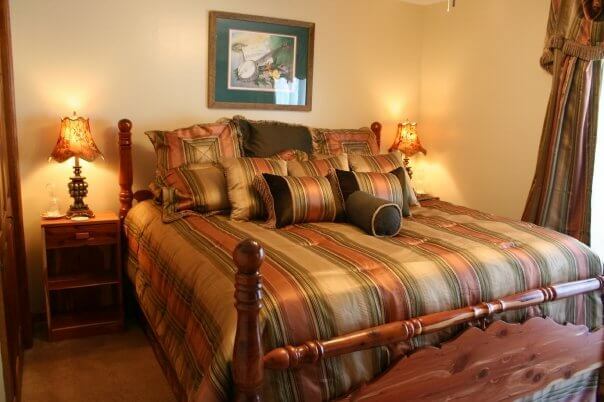 A Wyndham Vacation property, Baskins Creek offers excellent access to the heart of downtown Gatlinburg. 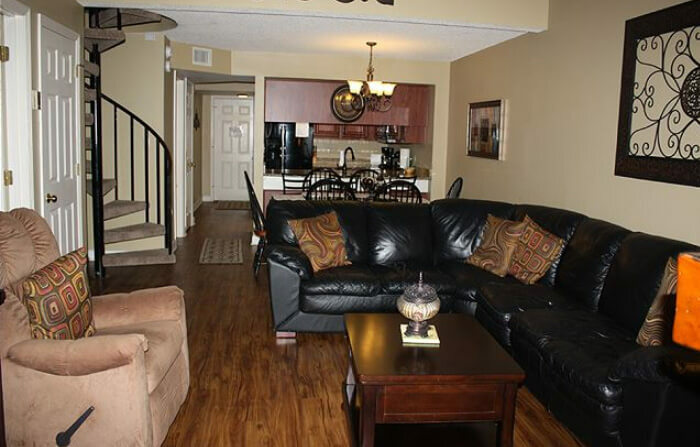 All rentals have a fully-equipped kitchen and whirlpool tubs. They provide access to a seasonal pool, hot tub, and gym. Free Wi-fi is also available in all condos. Choose from a 2–3 bedroom condo and enjoy a private lodging experience steps away from the Great Smoky Mountains National Park. All of the condos at Park Place On the River feature fully-equipped kitchens, washer/dryers, and access to a seasonal pool, hot tub, and exercise room. There are also accessible rooms available. The location allows for quick access to the Ober Gatlinburg Aerial Tramway. 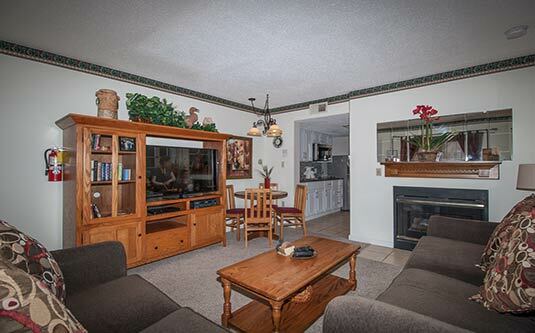 Each of Laurel Inn’s 1–2 bedroom condos has a fully-equipped kitchen and a fireplace. Many units also have a private balcony. They offer a heated outdoor pool and guest laundry access. The wooden stairs will take you from the condos down to Reagan Drive, which you can follow until you hit Ripley’s Believe it or Not! Museum, right in the heart of Gatlinburg. Cabins and Chalets offer some of the most secluded and private lodging experiences. Not all have access to amenities like Wi-fi, cable TV, or pools/fitness areas, but they can have the comforts of home with an equipped kitchen, grill, and washer/dryer. Plenty come with a private hot tub. While they did lose a good deal of their Roaring Fork area rentals to the Gatlinburg fire, they do have a lot of rentals off of Ski Mountain Road and other areas available. They offer some pet-friendly cabins with spaces for your dog to roam outside (up to 50 lbs), authentic log cabins for you to blend in with the natural scenery, and cabins that will accommodate large groups. Standard amenities include cookware, starter toiletries, and starter paper products. Many of the American Patriot Getaways properties available in the Gatlinburg area offer a private hot tub and even access to a pool. Their website allows you to filter by amenities, which is very helpful. 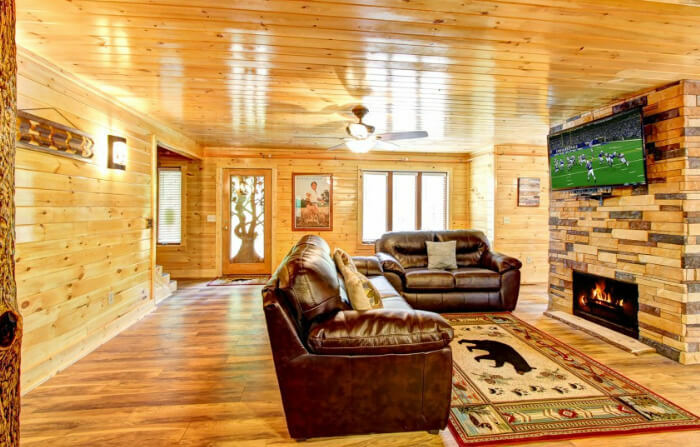 If you are looking for a cabin that has a mountain view or home theater you can filter to show only the properties that have those features. 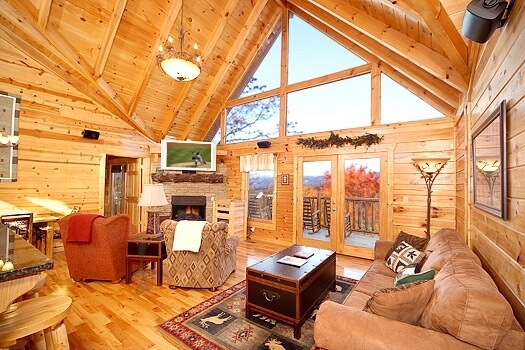 Their Gatlinburg rentals are a mix of cabins and chalets. Some are pet-friendly, so check before booking. If you plan to experience some of the exceptional attractions in Gatlinburg, staying at Auntie Belham’s will get you a free adventure pass, with admission to attractions like Ripley’s Aquarium of the Smokies, WonderWorks, the Comedy Barn Theater, zip lines, and rafting. They offer one admission per unit, per paid night stay. Your kids will love the Xplorie Movie Night kiosk, with unlimited movie rentals every day of your stay. Enjoy an intimate home-away-from-home experience when you book your stay at one of the local bed and breakfasts in Gatlinburg. As your stay is less sequestered from other visitors, you’ll want to check on policies on whether they allow children. 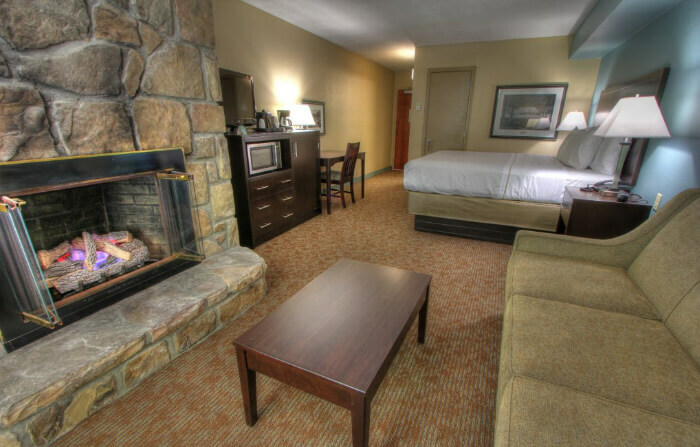 Staying here will put you only a mile away from the Great Smoky Mountains National Park. More like a resort, Buckhorn Inn offers several types of accommodations, from traditional rooms in the main building to guesthouses and private cottages equipped with living rooms and fireplaces. During your stay on the secluded 25-acre property, you can enjoy a nature walk on the self-guided trail, or walk through Rachel’s Labyrinth, a beautiful fieldstone path in one of the meadows. Complimentary breakfast is available in the main dining room between 8–9:30 a.m. daily. If you don’t want to head out for lunch or dinner, they offer both for a fee. If you want to learn how some of the tasty dishes are made, cooking classes are available with Chef Frank Downs. There is a fitness center on-site, which is open from 7 a.m. until 7 p.m. daily. Children aged 12 and up are allowed in all accommodations, and younger children are allowed in the cottages and guesthouses. 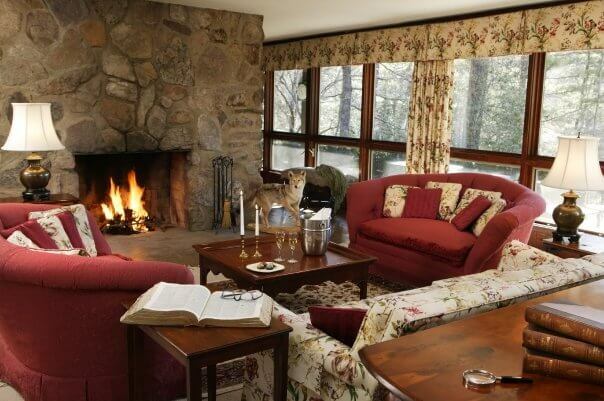 Located off of light #2, the Laurel Springs Lodge is beautifully situated against the foliage of the mountains. They have five guest rooms with private bathrooms, and most overlook the Little Pigeon River. A complimentary homemade breakfast is served from 8–9 a.m. daily, and they provide treats in the rooms in the afternoons. Special diets can be accommodated with advance notice. While they don’t allow pets, they do work with a local dog boarder for a discounted rate. Children aged 10 and up are allowed with prior arrangement. With an overlook of the Great Smoky Mountains National Park and Mt. LeConte, you’ll be able to relax and enjoy the scenery as you wake up every morning. The location is at the crest of the mountain off of Ski Mountain Road, and far away from the hustle and bustle of downtown, yet close enough for easy access. In the months of January through March, they offer a cooking school, with lessons taught by a professional chef. 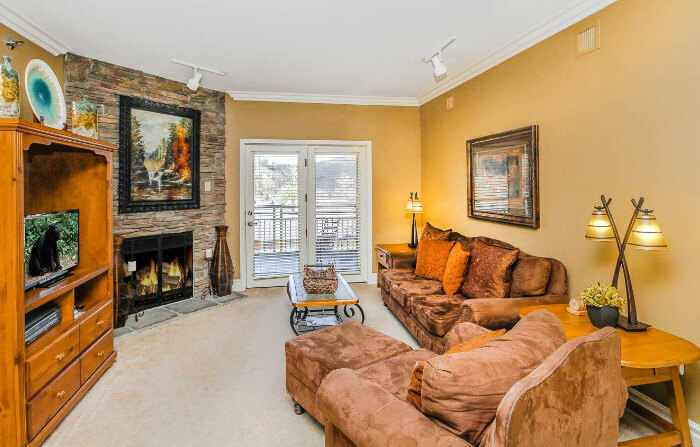 You’ll find four guest rooms, two of which are second-floor suites containing fireplaces. Breakfast is prepared by a professional chef and varies daily. Bottled water and soft drinks are provided complimentary in each room. Children are allowed with prior arrangement. If you prefer to travel in an RV or enjoy roughing the outdoors with a group of people, then a campground or campsite is the way to stay for you. You’ll find some campgrounds offer pools, hot tubs, and bathhouses. 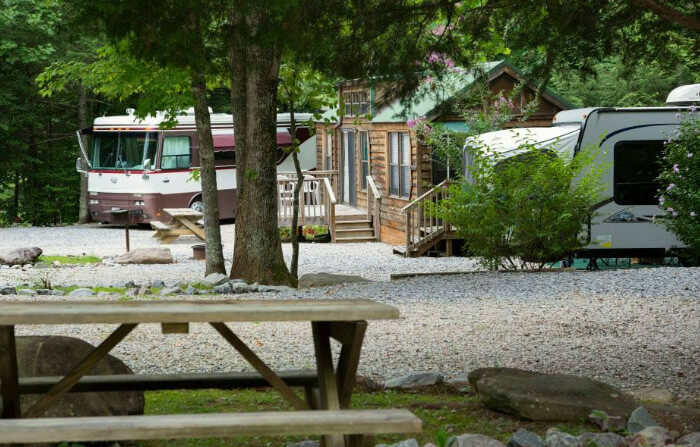 Situated right beside the Great Smoky Mountains National Park, Smoky Bear offers concrete padded pull-through sites and gravel back-in sites with full hookups available. They also provide free Wi-fi and basic cable. The primitive tent sites offer guests access to all of the amenities, but they only have a few available. A seasonal pool and hot tub are available, and they have a bathhouse and laundry room open 24/7. This outdoor resort has several different types of accommodations and direct on-site access to the Gatlinburg Trolley. 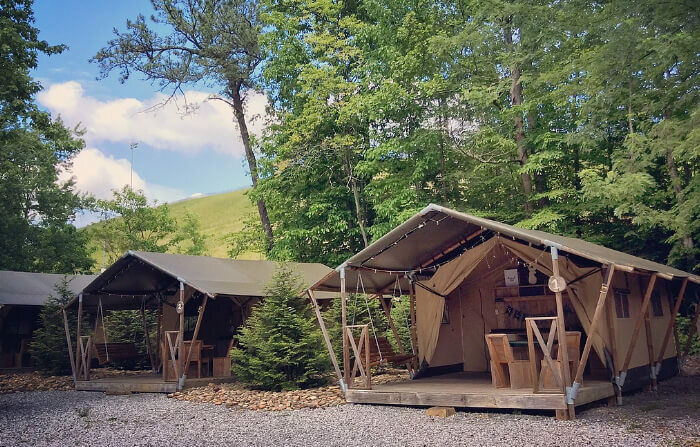 The primitive tent sites offer access to the rest of the resort amenities, such as the bathhouse, saltwater pool, playground, and general store. A step up from this kind of lodging is the safari tent experience. Each tent boasts private sleeping areas with a storage cabinet, toiletries, and a cooler stocked with complimentary ice and bottled water. Their RV and Camper sites provide electric service and full hookups. Cable TV is also available. Ever wanted to stay in a treehouse? Besides the RV/Camper sites, and tent sites, Camp LeConte also offers treehouses with open-air bedrooms. The Great Smoky Mountains National Park has campgrounds at ten different locations throughout the park, with some having seasonal availability. All have more stringent regulations and procedures than a privately owned campground to keep the wildlife and surrounding area remaining safe and beautiful. The Frontcountry sites have restrooms, but no electrical or water hookups. They aren’t as primitive as Backcountry sites, however. They will accommodate tents, pop-up trailers, and RVs. Plus, they can support groups of seven or more with reservations. If you want to plan an overnight stay in the Backcountry as a hiker, you will need to get a permit and reservations. Five different drive-in horse camps are in the park. You must have a horse to camp there, and they must board in the stalls. They all provide access to the backcountry trails. The campsites vary in amenities, so check out each of them before making your decision. We hope you enjoyed our list! Do you have more ideas of possible lodging locations now? You can make each vacation a new experience by trying a new type of lodging every time you visit, or find one that you love and make it a family tradition to visit.